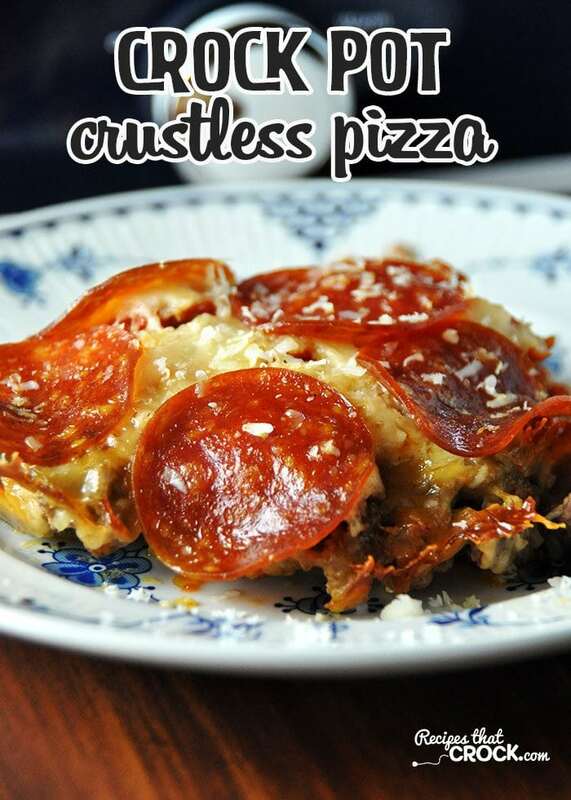 Crock Pot Crustless Pizza - Recipes That Crock! You know we love pizza around these parts and up at Cris’ house. Well folks, have I got a treat for you! This Crock Pot Crustless Pizza that I adapted from Gooseberry Patch’s Game-Day Fan Fare is delicious! And, it can be made low carb if you use low carb pizza sauce! Below is our most recent video featuring this reader favorite recipe! The adults in my small group love good food and the kids are picky eaters, so they are a great test group for recipes. Every 7th Sunday, my small group has a tailgate night, so I knew I had to make this Crock Pot Crustless Pizza! And boy was it a hit! One of the great things about this recipe is that you can change it up to fit your taste. Love a bunch of toppings on your pizza? Add them in! Is the classic pepperoni pizza your favorite? Then pepperoni and cheese it is! Also, this Crock Pot Crustless Pizza goes perfectly with this Garlic Bread. Yum! Adapted from Gooseberry Patch’s Game-Day Fan Fare . I used my beloved Cassie, my casserole crock pot, for this Crock Pot Crustless Pizza. It worked perfectly. If you don’t have one, I would use a 5-6 quart slow cooker since there is quite a bit in this recipe. Cris’ family uses this a low carb marinara sauce to make this dish Low Carb Crock Pot Crustless Pizza. Below is our original Crock Pot Crustless Pizza Video. This Crock Pot Crustless Pizza is so easy to make and can be made to fit your family's favorites! Adapted from Gooseberry Patch's Game-Day Fan Fare . 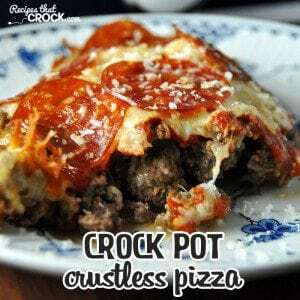 Cris' family uses this a low carb marinara sauce to make this dish Low Carb Crock Pot Crustless Pizza. Previous Post: « 7 Meals for Less Than $50! Could this be cooked in the oven instead of a crockpot? I haven’t made this in the oven yet, but I’m sure you could. Enjoy! Has anyone tried this replacing the mozzarella with cream cheese? I think it might make a better consistency. I haven’t tried that, but if you do, let me know how it turns out! Enjoy! We do not figure that information as it will vary based off of the products they choose to use. Enjoy! This looks wonderful. I’m making it this week.? Dori: go get you a Cassie. I dreamed about this crockpot for a week and finally just went and bought me one. Love it. You are going to love it! I’m so glad you have a Cassie of your own! She is such a versatile crock pot! Enjoy! This pizza will be a hit at my house! I’m so glad to hear it! We love it around here! And it is so easy, I have added it to my “go to” list for when I need a yummy recipe! Enjoy! I like sausage pizza so I’m going to try this with 1 pound of ground beef and 1 pound of sausage. Thanks for the recipe. Thank you so much for your kind words! I am so glad you have enjoyed these recipes as much as we have! You will enjoy having a Cassie of your own! I sometimes wish I had two or three…however, Michael thinks I have too many crock pots already! Silly man! 😉 Enjoy! Yes, I used my casserole crock pot, the one I called Cassie. 😉 Below is a link to one just like it!